I knew I had you at no-bake. 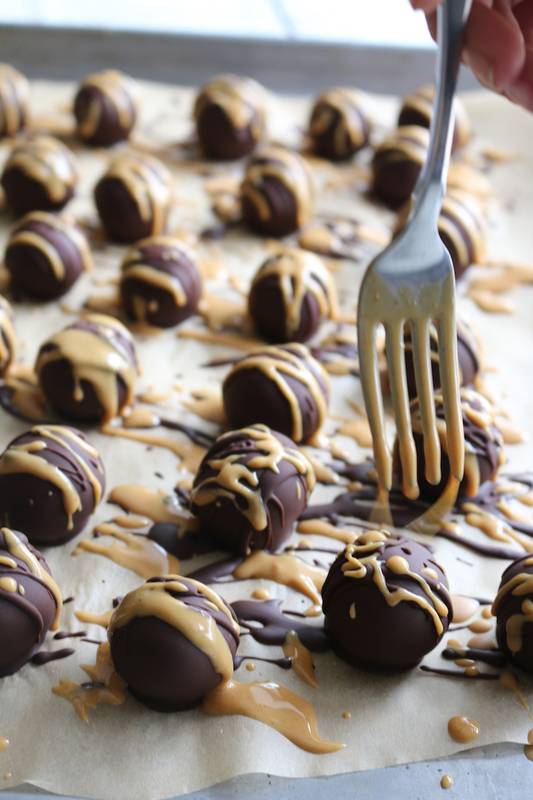 Yes, that’s right these vegan no-bake peanut butter chocolate truffles don’t require any cooking. Healthy and full of peanut butter chocolate flavor. Did I mention they are naturally gluten free?! No one will be able to taste the different. They are also super simple to make and perfect for getting your children in the kitchen, just be prepared they may be fighting over who will lick the spoon! 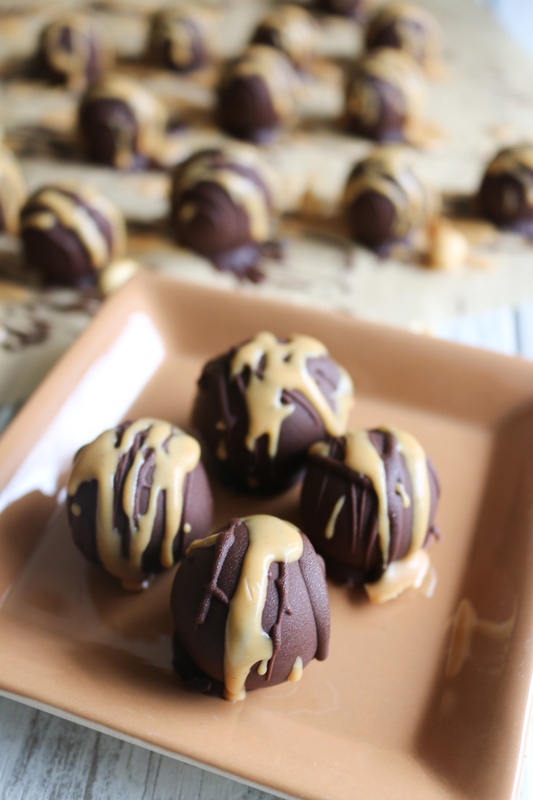 These peanut butter chocolate truffles are great for any occasion. Perfect for a romantic dessert for your sweet significant other (Valentine’s Day is around the corner), an elegant party, or for yourself because you deserve to be pampered with wonderful treats like this. 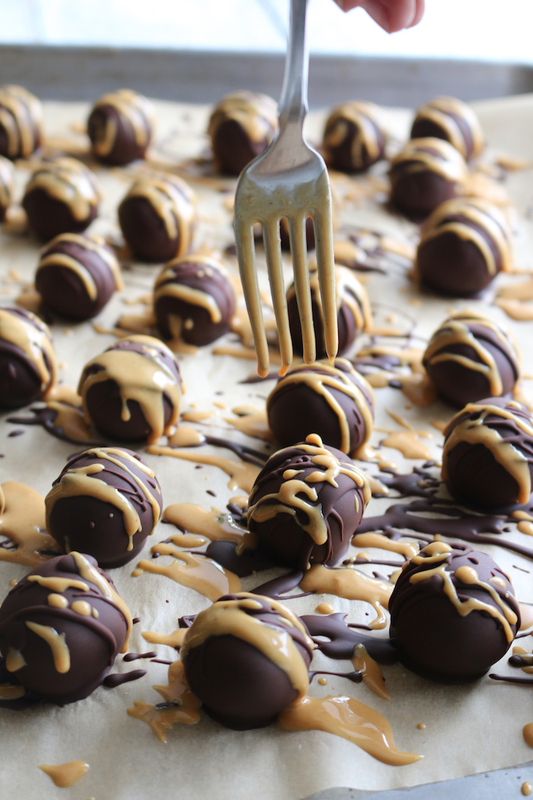 Peanut butter and chocolate, who doesn’t love this favor combination? But how healthy can it be? Wouldn’t we all want a dessert that tasted like peanut butter and chocolate but nourished our body like celery and carrots? I know I would! 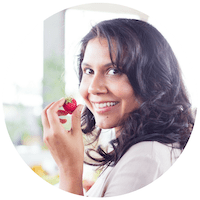 Well, it’s all about moderation and if you follow me and seen my recipes, you would know that I focus on all-natural, plant-based, non-dairy, and gluten free ingredients. All focused on getting the most nourishing but taste combo to fuel your plant powered lifestyle! 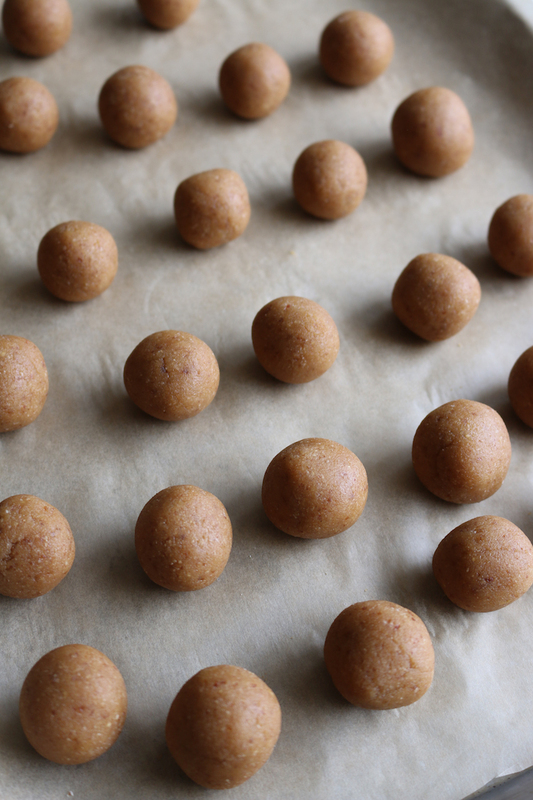 These peanut butter balls forgo the powdered sugar and butter, and instead use a healthy ingredients while using only a fraction of the sweetener compared to traditional recipes. You’ll wonder how you ever lived without this recipe around the holidays! It’s quick to throw together and makes about 12-15 bite size truffles. 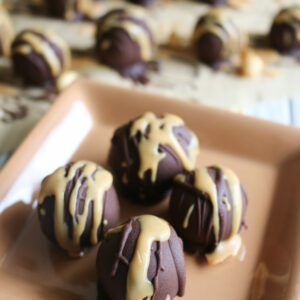 Chocolate truffles filled with sweet and creamy peanut butter filling, and coated in a shell of chocolate. A decadent treat made with only five ingredients! In a food processor, add the the dates and process for several minutes until a sticky, caramel-like consistency is achieved. Scrape down the sides as needed to ensure all pieces are processed. Then add peanut butter, coconut flour, and vanilla into the date mixture and process for 2 minutes or until a smooth consistency. Use a cookie scoop or tablespoon to scoop truffle filling into balls (about 1-2 tablespoons per ball). Place on parchment-lined baking sheet and freeze for 20 minutes to set. 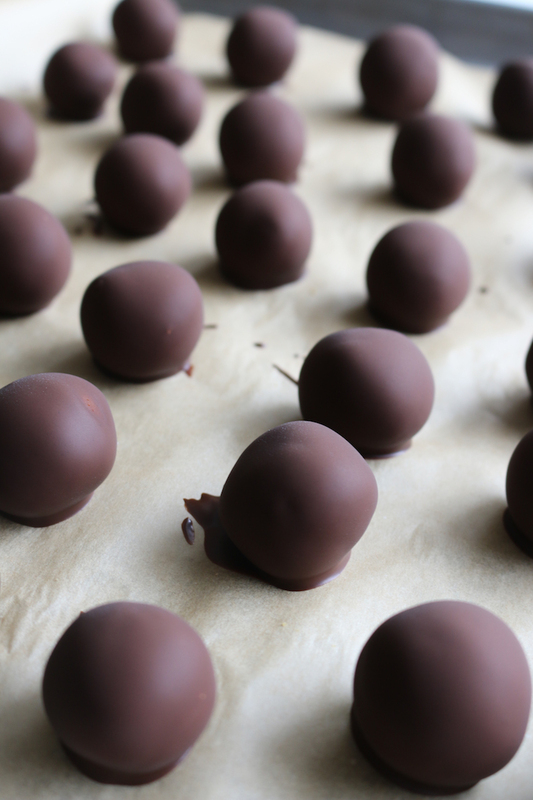 Once truffle balls are ready, prepare the chocolate. Using a mixing bowl, combine all the ingredients, stirring with a risk until melted and full combined. In a microwave-safe bowl, add the chocolate chips and coconut oil. Microwave in 30-second increments, stirring between each, until melted. Then use a fork to dunk each truffle into the chocolate and coat completely. Tap off extra chocolate and return to the parchment-lined baking sheet. Repeat with each truffle. Place truffles in refrigerator for 30 minutes to set. 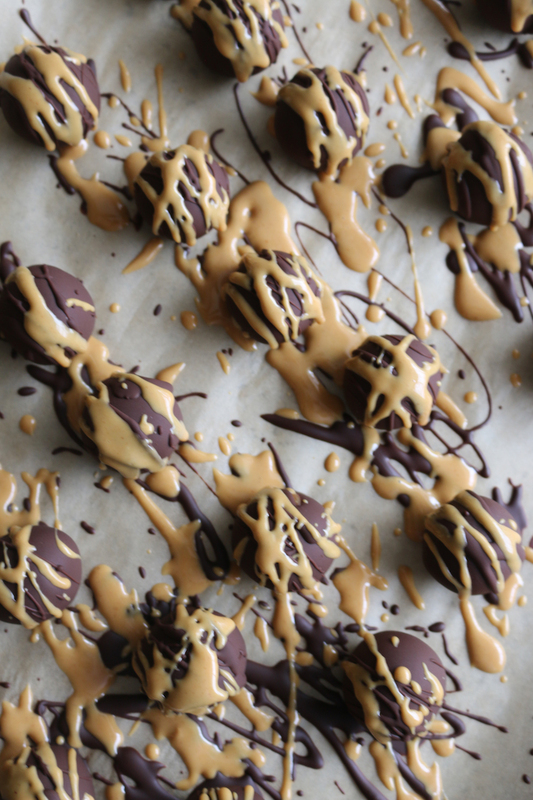 Drizzle creamy peanut butter on top or sprinkle with sea salt. Enjoy! Stored in an airtight container in the fridge (or freezer). What your favorite dessert combonations?! Be sure to share your thoughts in the comments or by leaving a review which helps me make these recipes better for you. And when you make this recipe, share a pic on Instagram with #livesimplynatural so I can see too!